Avon Books. MASS MARKET PAPERBACK. 6188263131 Crisp pages. Tight binding. Creased cover. Name of previous owner written inside. Light shelf wear on cover. Tanning throughout. Dented corner. Sun fading. Good reading copy. . Very Good. Avon Books. Used - Good. Good condition. Slightly dampstained. Star Book, 1979. Paperback. Good. Disclaimer:A copy that has been read, but remains in clean condition. All pages are intact, and the cover is intact. The spine may show signs of wear. Pages can include limited notes and highlighting, and the copy can include previous owner inscriptions. Avon Books,. Used - Good. Shows some signs of wear, and may have some markings on the inside. New York: Avon, 1968. Used - Good. Good condition. Mass Market Paperback edition. Owner's name on inside. New York: Avon, 1968. Used - Acceptable. Acceptable condition. Mass Market Paperback edition. Writing inside. Fair. Offered by the UK charity Langdon. Supporting young men and women with disabilities. Avon Books,. Used - Acceptable. Ships from the UK. Former Library book. Shows definite wear, and perhaps considerable marking on inside. 100% Money Back Guarantee. Your purchase also supports literacy charities. Avon Books. MASS MARKET PAPERBACK. 6188263131 Good Condition. Crisp pages. Tight binding. FIRST EDITION. Light fading on cover. Good reading copy. Shelf wear on cover. Light tanning. Some rubbing wear to cover edges. Creased cover. Creased binding. - All books inspected inside and out and shipped by USPS with a tracking number! I highly suggest that you choose expedited shipping. For a small fee you get priority shipping, insurance and a padded envelope for the best protection. . Good. New York, New York: Avon Books, 1972. Later Printing. Softcover. Good/No Jacket. Used Book: Mass Market Paperback Standard used condition. Reading copy or better. Avon Books. Good. 1968. Stated First Printing. Paperback. The spine and both covers, next to the spine, are creased from reading. The pages are clean, no tears or soiling. The pages and binding are tight. All three page edges are red stained. The lower left corner of the front cover has the glossy paper peeled away. There is a red 'N' written on the top page edge and a used bookstore's stamp on the first page and a previous owner's name on the title page. Both right corners of the front cover are creased as are both left corners of the back cover. The edges of the covers and spine are lightly scuffed from shelf wear. 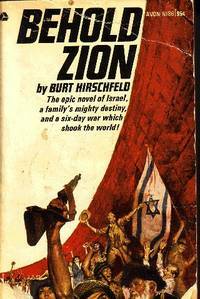 ; 16mo 6" - 7" tall; 443 pages; The epic novel of Israel, a family's mighty destiny, and a six-day war which shook the World! From the back cover: "A triumphant drama of human courage is enacted in of the most exciting novels of our times. Nearly three decades ago, Amos Landau fled Germany to make a new life in Israel. Then as the world witnessed first the brave nation's struggle for independence and later the bloody border clashes, the family of Amos Landau prospered. Finally in the blistering summer of 1967, the inexorable historical forces of a new war caught up Amos, his wife Ruth, and their sons and daughter; the fighter Yaakov Yeshivat; the beautiful actress Mara Gabrielli; and the adventurous American photographer Hank McClintock. The world would wait tensely while the battle raged--the world would now Behold Zion." Will combine shipping on more than one book. .